Deep breaths, everyone. It’s probably time to start thinking about Thanksgiving dinner. What will you bring to the table? Allow me to make a special seasonal suggestion. This tangy, sweet-and-smoky, soul-satisfying butternut braise is remarkably easy to make but special enough for a nice weekend gatherings, and yes, it’s the perfect (if unexpected) Thanksgiving side dish. And it’s comfortable in a variety of roles, from support for a grilled pork chop or chicken breast, or as a nice light dinner accompanied by a side salad and a few slices of goat cheese or cheddar cheese. 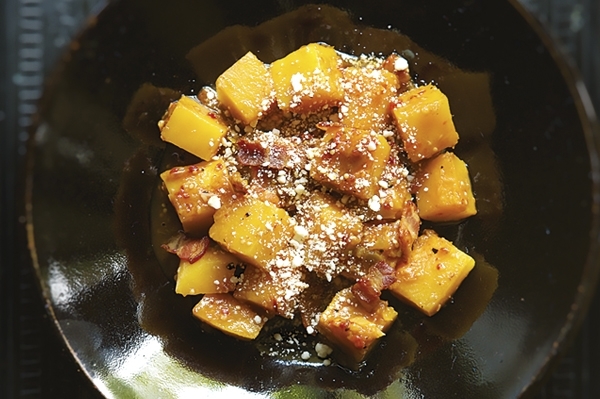 Note: Though this is sweet, creamy and delicious with butternut, it’s also great made with pumpkin (especially pie pumpkin), red kuri, kabocha, dumpling, acorn or delicata squash; you’ll need about 3 cups of peeled cubes. Not in the bacon-makes-everything-better crowd? This dish is very good without it. Set a large (10-inch) skillet (nonstick or lined with foil) over medium-high heat and lay in the garlic and tomatillos (cut side down). When the tomatillos are well browned and soft, 5 to 6 minutes, flip everything over and brown the other side. (The garlic should be soft.) Cool, then peel the garlic. In a blender, combine the garlic, tomatillos, chipotles and 1 cup water. Blend to a coarse puree. Scoop the butternut pieces into a microwave-safe bowl, cover with plastic wrap, poke a few holes in the top and microwave on high for 4 minutes. Meanwhile, in a large (10-inch) skillet set over medium, cook the bacon, stirring occasionally, until crispy, 5 to 7 minutes. Add the butternut and tomatillo sauce to the pan, raise the heat to medium-high and bring the sauce to a brisk simmer. Cook until the butternut is fork-tender and the sauce has reduced by about half its volume, about 15 minutes. Taste and season with salt (it will need only about ¼ teaspoon because of the bacon’s saltiness). Scrape into a serving bowl and finish with a generous sprinkling of the queso. Here is the recipe for the Lamb Barbacoa and his brands used are listed in the comments below. As far as the rice cooker – the brand we use in the test kitchen is a Sanyo. Enjoy!